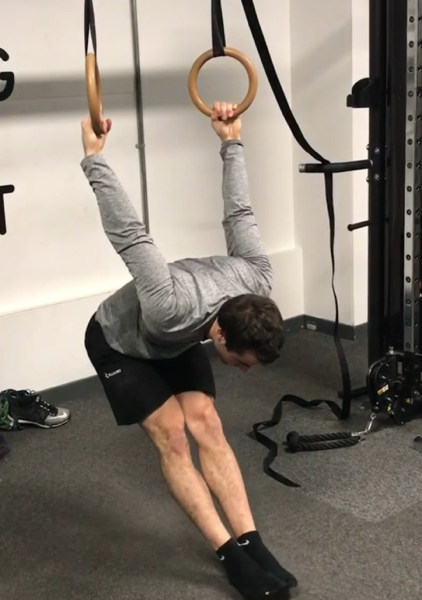 Following on from my first article regarding shoulder extension and bodyweight movements, this follow up, including some more advanced exercises using the gymnastic rings, bands and stick/barbell drills is a good way to progress and improve your movement vocabulary. Extension can occur in the overhead range, laterally (out to the side) and posteriorly (behind you) in the case of the shoulder, due to the large range of motion about this joint. Following on from part 1 - top 5 bodyweight exercises, we are now going to explore bodyweight and barbell exercises that can be used for improving the range of motion and beginning to develop more active mobility now that we have built passive mobility using the exercises in part 1. This drill is very effective to use as part of your movement preparation and warm up, as well as an active rest between sets. This exercise is best performed once you have established a full range of motion about the shoulder as if you suffer from any for of impingement this may aggravate the issue. This can also be included in daily movement practice to improve the range of the shoulder gradually in all populations. Standing, take a light resistance band to begin with and hold it shoulder width apart. Keep glutes and core active so that all movement comes from the shoulders. 4. Perform 5-10 reps/side of each variant, or work for time, depending on your preference and current mobility level. 4. From here, pull yourself back out to the start position by reversing the movement. 5. Repeat for 3-5 sets of 3-5 reps.
6. Once you are comfortable with this movement and sitting in a deep stretch or 10-15s is manageable, begin to take more and more weight through the arms until your feet leave the floor and you are in a full hang. Be aware for any pain in this position, especially down the bicep. If you feel a sharp pain at all, stop and regress the movement. Due to the deep stretch in the bicep that this position provides, if you aren’t ready to hang, injury can result. This exercise is challenging and is a test, not only of shoulder extension, but also of active range of motion, i.e. The range that you can control. The movement is designed to develop strength through the range of motion over time. Whilst standing, hold the stick with arms relaxed behind the body, palms facing forwards and as close to shoulder width as possible. Hold here for 5s, then lower under control and repeat for 5 reps.
Once you can complete 3 sets of 5 reps with this hold, its time to increase the weight on the bar slightly. Perform a knee raise/ toes to bar movement whilst simultaneously pulling the hands towards the hips (pull with the lats) in order to pull the knees through the arms. Once you are in the inverted position, keep pulling through until you end up in the German Hang position, control this movement by keeping tension through the arms and chest. Try incorporating these exercises into your current training and see how they help to improve your shoulder health, mobility and strength once you have developed sufficiently with the exercises in shoulder extension part. These can be excellent as part of skill block or to add into a core routine. Take the time to practice these movements and then build on them. They are, by no means, the only exercises to improve this range or strength through this range, and if you would like more alternatives, please get in contact and i will be able to discuss this with you.